Foot problems in cattle are of great concern, as an animal’s ability to move and level of pain, will affect its feed intake and productivity. Several culprits are to blame for foot problems. 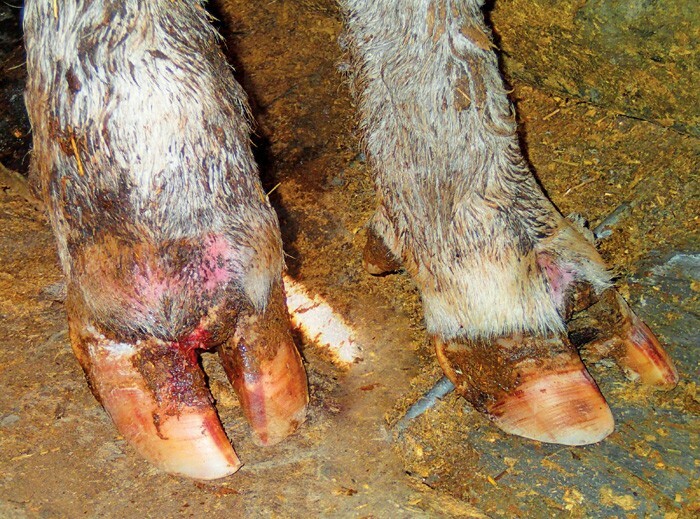 Foot rot is an infectious disease caused by a bacterial infection between the claws or hooves. This problem often occurs where animals are exposed to muddy and wet conditions. “The bacteria gain entry between the claws and cause swelling and a purulent discharge. Use either zinc sulphate, copper sulphate or formalin in the foot bath. “Take care when you use formalin, as it can damage your skin,” warns Dr Declercq. If possible, also treat the area with oxytetracycline. In severe cases it may be advisable to inject the animal with oxytetracycline for at least ten days. Dr Declercq warns against the immediate use of antibiotics in the case of an abscess. “If you treat it with antibiotics the abscess will not ripen, and the animal will continue to have problems for some time. Wait for the abscess to ripen, allow it to drain, and then treat it with antibiotics if necessary. Although it is not as common in cattle as in horses, laminitis should not be disregarded. It is often found in feedlot situations where animals are prone to acidosis. This article is part of a series of informative animal health articles. The series goes hand in hand with the #VideoVet video series that can be viewed on www.agriorbit.com. Watch the video below.